Who doesn't enjoy receiving gifts of love? If you know of any married couple who has not yet been encountered, inviting them to the next ME Weekend is THE gift of love! It's something tangible that you can give a couple to not only enrich their marriage but the lives of all their loved ones. ME is unique in that it allows couples to dig within themselves to discover how much in love they are with their spouses, even after 5, 10, 20, 30, years of marriage. The true secret to a healthy and loving marriage is excellent communication and that is the essence of Marriage Encounter. 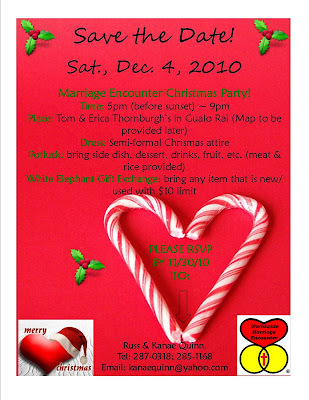 If you're interested in inviting a friend, please feel free to have them contact Jake & Jackie Van Dam at 285-9272. Registration is still ongoing for the Fall Weekend scheduled fo October 8~10, 2010 at the Saipan Grand Hotel. The cost is $50 per couple and includes two nights' accommodation, all meals and materials. What a deal! There is no better gift to give any couple than ME! We are recruiting couples for October 8-10 Weekend. Please let us know if you need us to email you the registration forms. 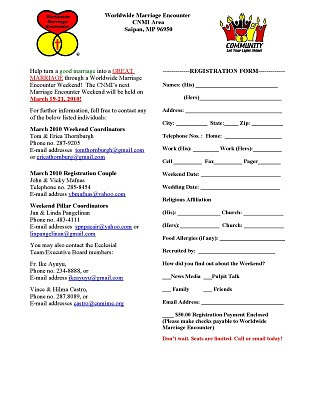 To expedite the registration, please call your couples and fill out the form for them. After that, you may forward the forms to the Castros, the VanDams or Vicky Mafnas. Also, we are recruiting couples for Pulpit talks. Please email Carol H. at prideof90@gmail.com if you are interested in doing one (or two, or three). Any help we can get will be a big one!! Just let us know the church and time...we'll send out the dates we can start once Pale Ry confirms with us. Keep that spirit alive and see you all tomorrow for our weeklies! If you can't make it to our meetings, please try to make it to the Greet-In. We will be sending out the Weekend schedule at a later date. It's almost the end of summer and for some, school has already begun. We wanted to get the ME Community back together for a nice, casual BBQ/Picnic down at Pak Pak Beach in San Antonio. Please bring a dish to share, some drinks and your families! We look forward to seeing you there. A few of the Steps groups concluded prior to the summer break and we congratulate them for their speedy completion. We are tackling Step 7 tonight and Step 8 on Monday. The Steps concepts are invaluable. Not only do they remind us of how we should treat others (not only our spouses), they also provide a great sense of belonging to a wonderful set of friends who, over the 10 sessions, become an extended part of our families. We now have many "Steps" children that we frequently encounter at various events around island. For those who have not yet been encountered, the next ME Weekend is from 8-10 October. Should you have any questions about the Weekend, feel free to email me at kanaequinn@yahoo.com.